Amazon took its first tentative steps into the streaming market last year, with Kabaneri Of the Iron Fortress. Since then it has snapped up exclusive rights to a number of currently airing anime, and even signed a deal for exclusive rights to every show in the Noitamina block. US fans have been confused, however, as while a number of these shows have been available via Prime Video in other territories (including the UK) they were no-shows stateside. Now we know why: Amazon has been preparing a dedicated anime service Anime Strike. 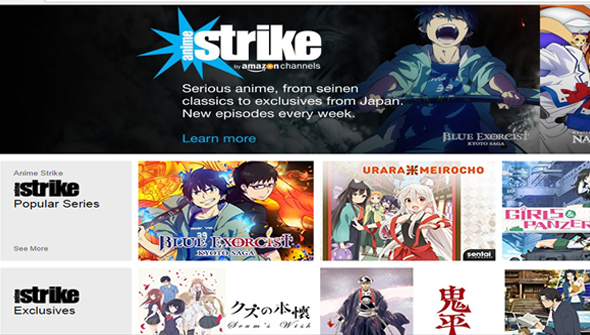 Anime Strike is one of a number of add-on channels available through Amazon Video and will cost $4.99 a month. The catch is that in order to get the service, you need to already be an Amazon Prime customer, which currently will set you back $99 a year. Amazon has exclusive rights to a number of series including The Great Passage, ViVid Strike and Scum's Wish, that will be available only through the new service, as well as a range of older titles, including films and series from other providers like Viz, Sony and Sentai Filmworks. There has been some negative reaction from fans who are not thrilled at the prospect of having to shell out for another streaming service in order to watch all the shows in a current season. A particular sticking point is the fact that some of these shows are available in other Prime territories as part of the standard Prime subscription (although this may well change in future). However, others are pointing out that this is a pretty major sign that one of the biggest brands in the world is starting to take anime very seriously. Which surely can only be a good thing? Prime members can sign up for a free 7-day trial.